Welcome to the Mesquite Belt Depot! The Depot and garden, Summer 2006. Yes, that is a REAL MKT signal ! Those who don't live in the northern half of the United States usually have one little problem trying to create a basement railroad empire....NO BASEMENT! There are several remedies to this problem, take over a bedroom (or sometimes two), take over the garage, or build a layout in a storage building of some size. I decided to try another approach. Build a depot! Probably the most critical ingredient to this recipe is an understanding spouse! 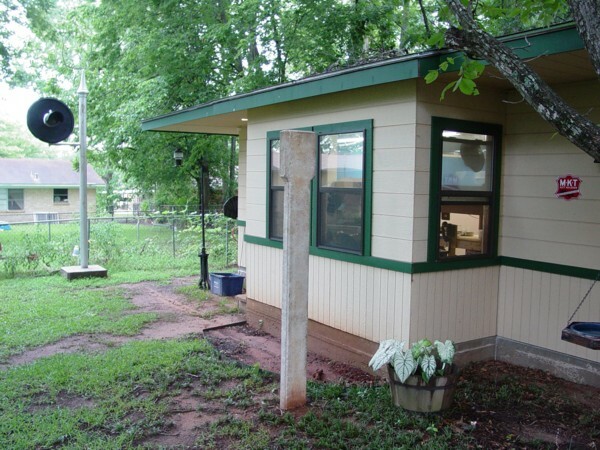 My wife Melanie and I bought a house that sat on a double lot in Palestine, Texas in 1997. 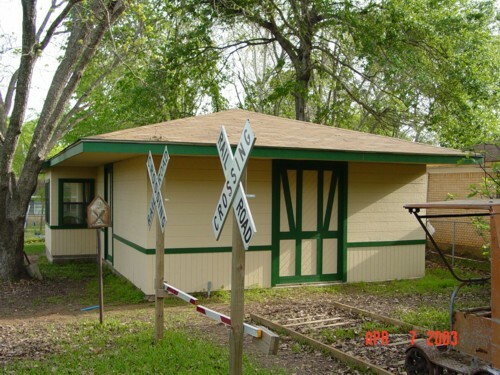 We agreed to build a train room in the backyard, since a large layout representative of Texas was the goal. Having a love of the MKT, a Katy depot was the way to go! Looking thru the Katy Standard Plan Book, the #2 plan, a 20'x40' depot was agreed upon. Protoypical for Missouri and Kansas, we chose this plan, rather than the prototypically correct #9 plan, the standard station for Texas and Oklahoma, a revision for the south of the #2 plan. 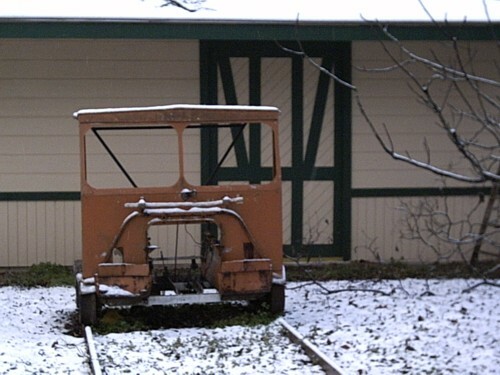 We chose not to build a "Jim Crow" depot, leaving those days of short-sidedness in the past. The only modifications to the original plans were 1)increase the operator space from 4'x8' to 4'x10' 2)change the roof framing structure necessary to remove all load bearing walls and have nothing but open space inside, 3)reduce the pitch of the roof to 4/12, and wall height down to 8' to blend in with the houses in the neighborhood. 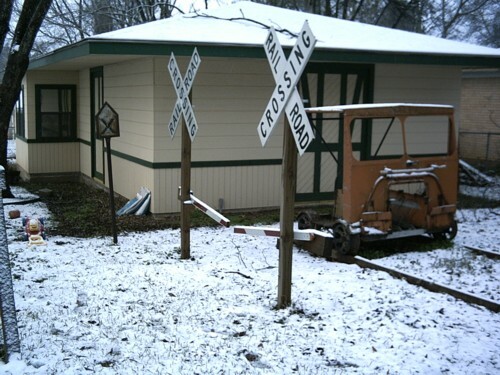 This is how the Depot looked as of April 7, 2003.